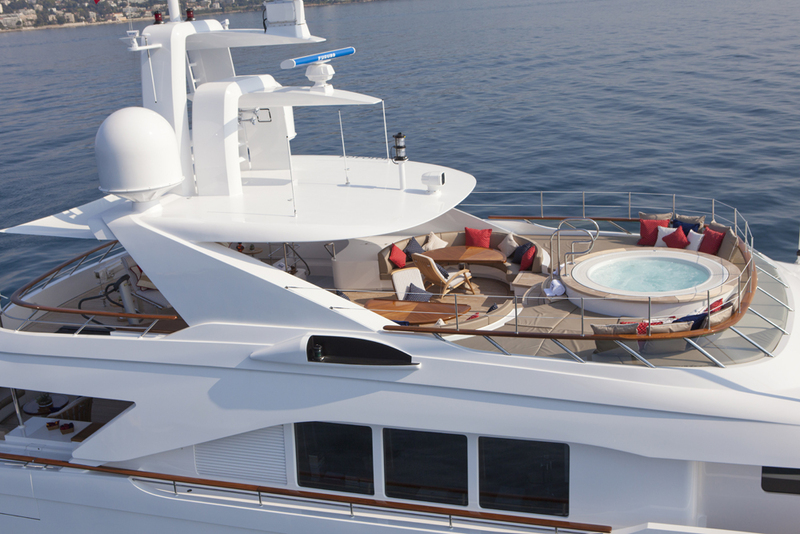 Luxury motor yacht REVELRY (ex SNOWBIRD, PRETTY WOMAN) is a 39, 00m (127' 11") Hakvoort built yacht delivered in 2010. 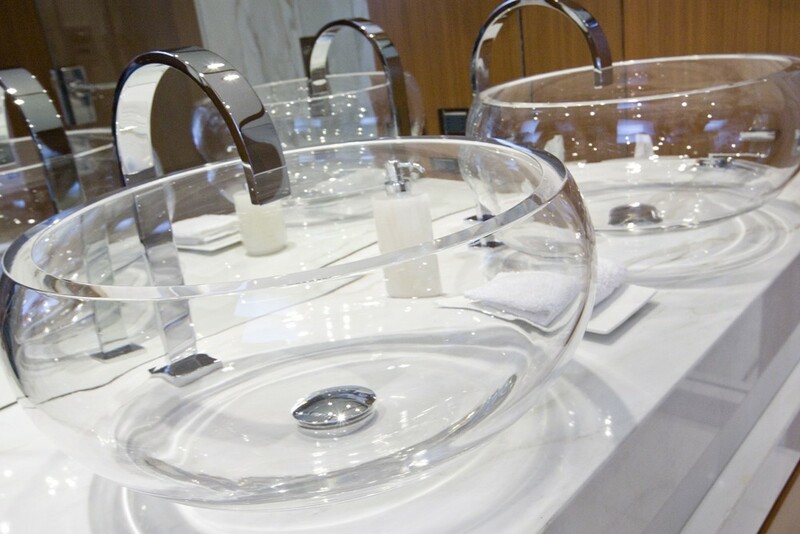 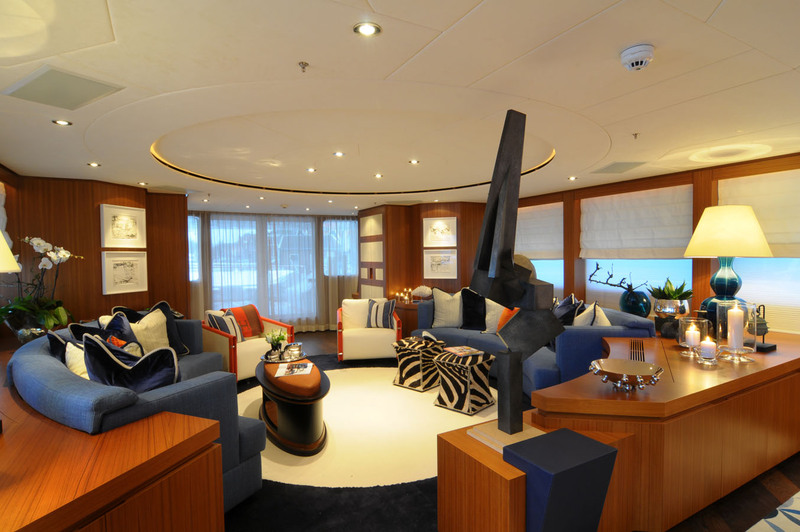 REVELRY has a modern interior with a nautical style. 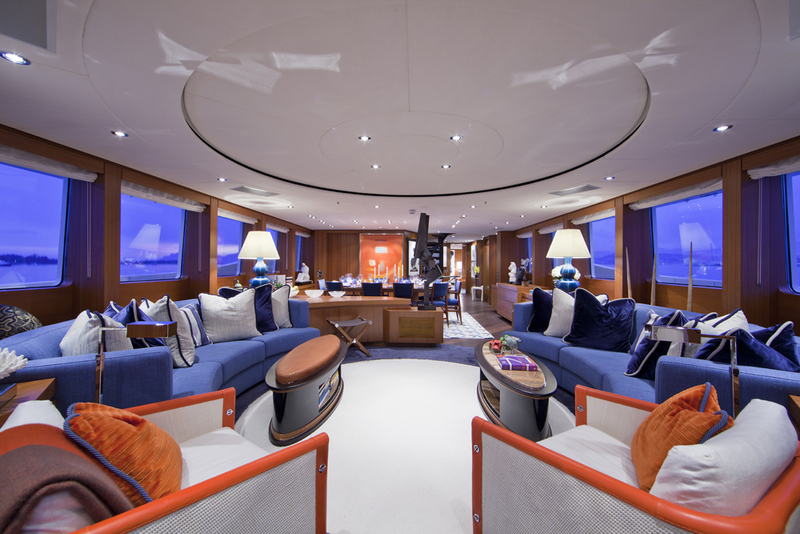 Her main salon features two sofas in an open plan arrangement with an adjoining dining area which is divided by a built in dry bar and large retractable flat screen TV and with DVD payer. 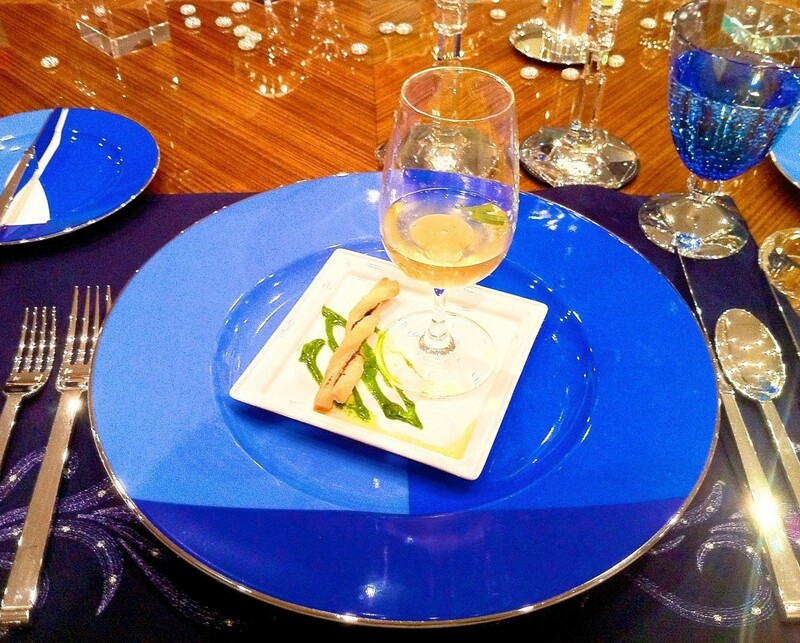 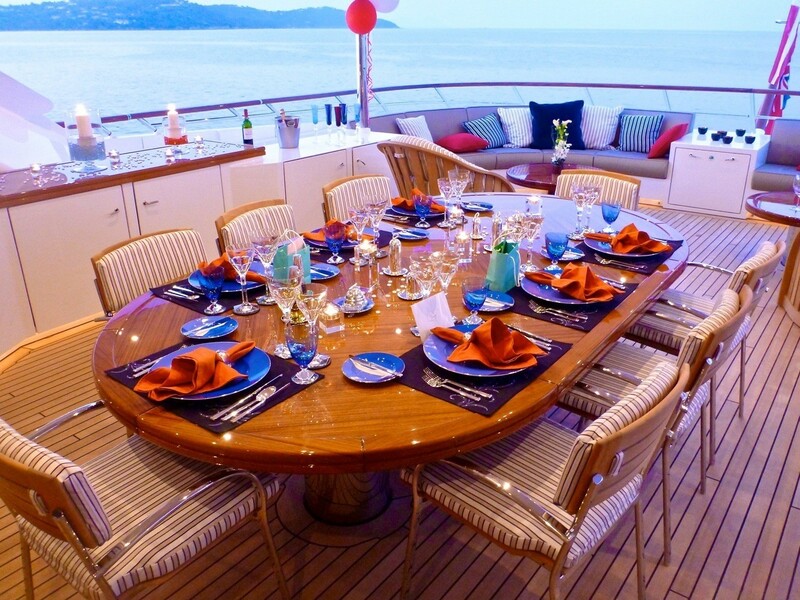 The dining area has a large table seating up to 10 guests. 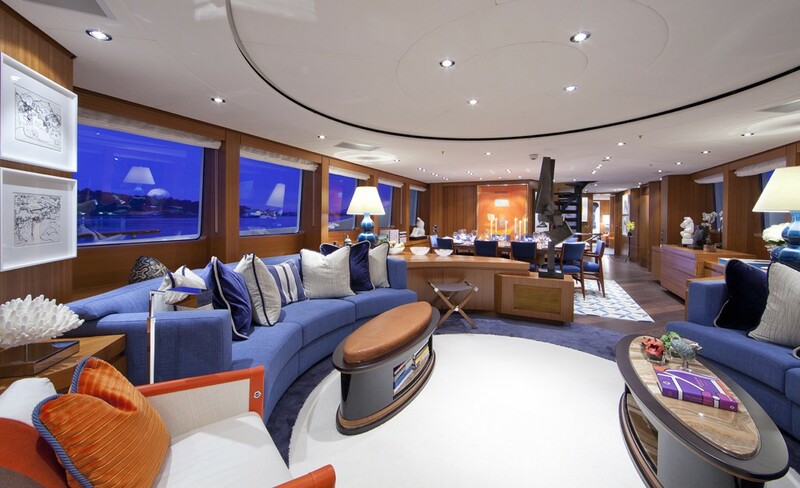 The sky lounge located on the Bridge deck, leads out on to an open aft area with built in seating and teak table’s ideal for cocktails, plus a 10-person teak dining table in the centre. 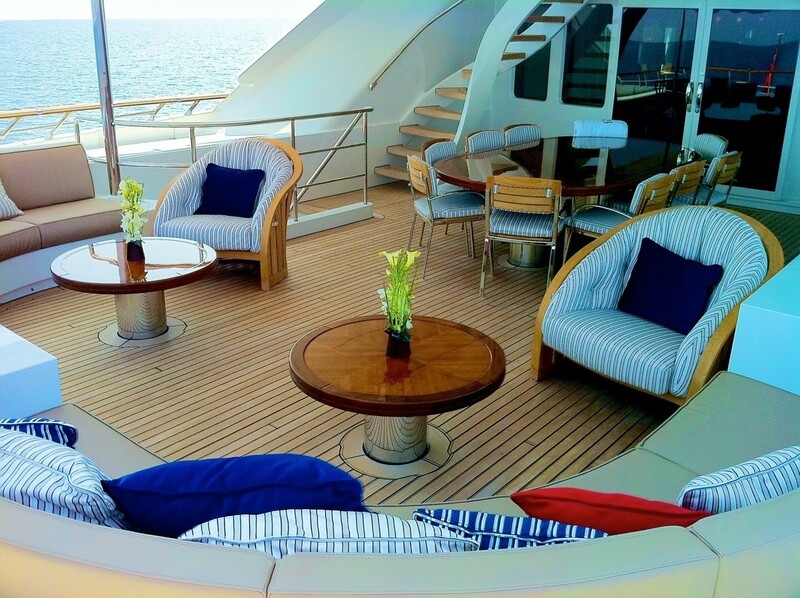 The sun deck offers plenty of open space for sunbathing and two large fixed U-shaped sofas and adjustable semicircular teak tables. 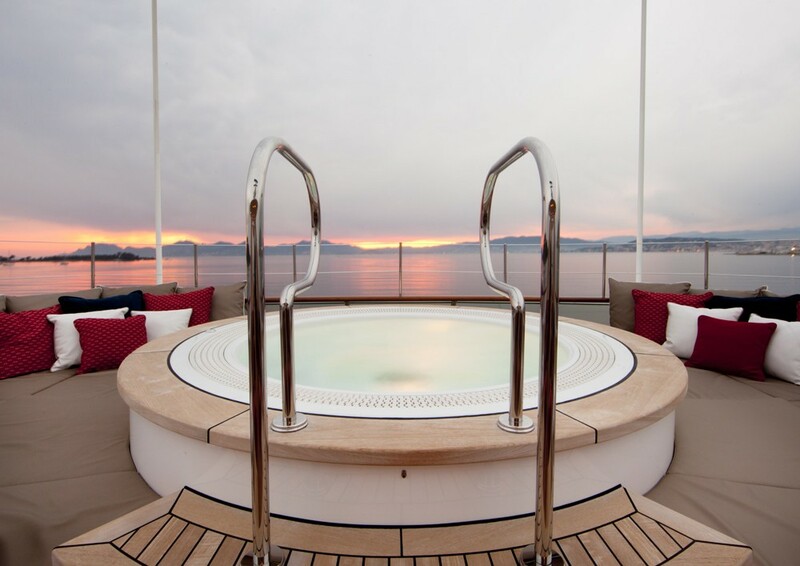 There is a large whirlpool spa pool forward seating 4 – 6 people and a BBQ grill for alfresco meals. 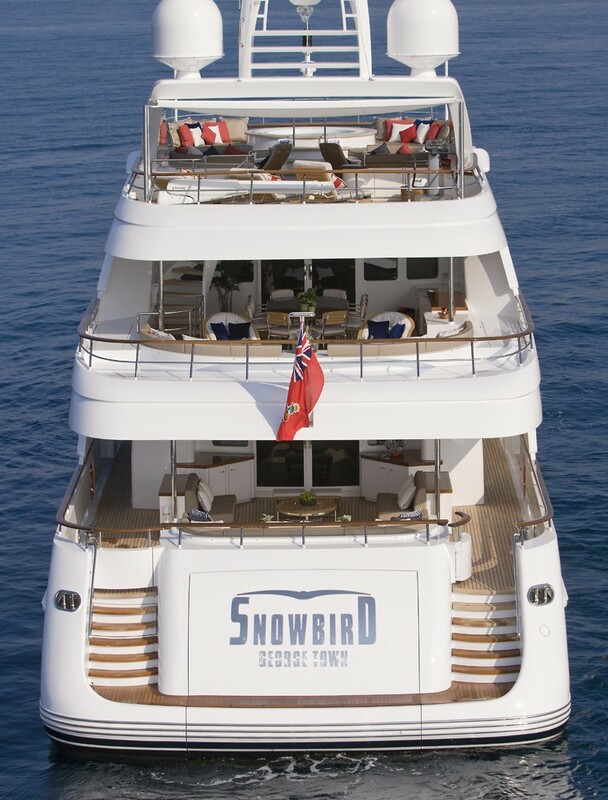 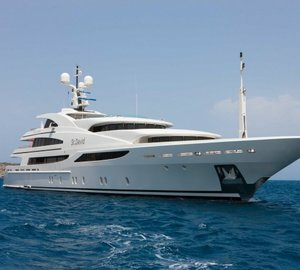 Yacht REVELRY (ex SNOWBIRD, PRETTY WOMAN) can accommodate 10 guests in 5 cabins. 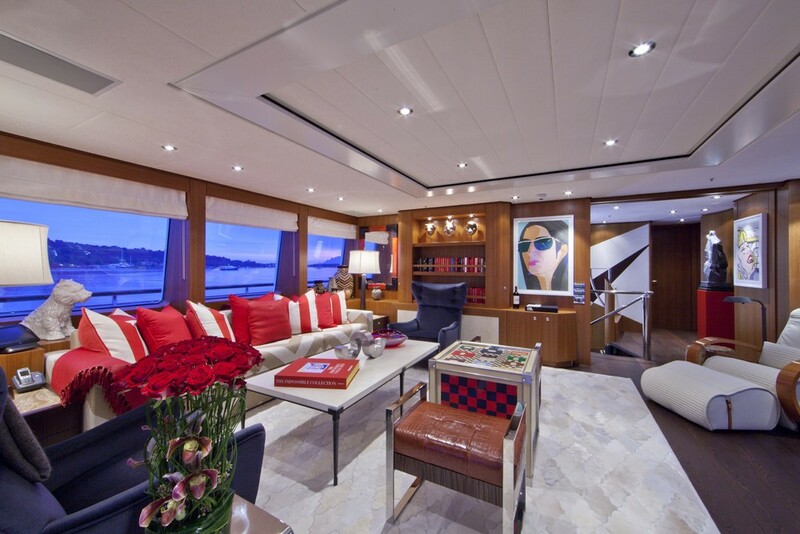 Her Master suite is full width of the beam, is located on the main deck and features a king size bed and large walk in wardrobe plus a study. 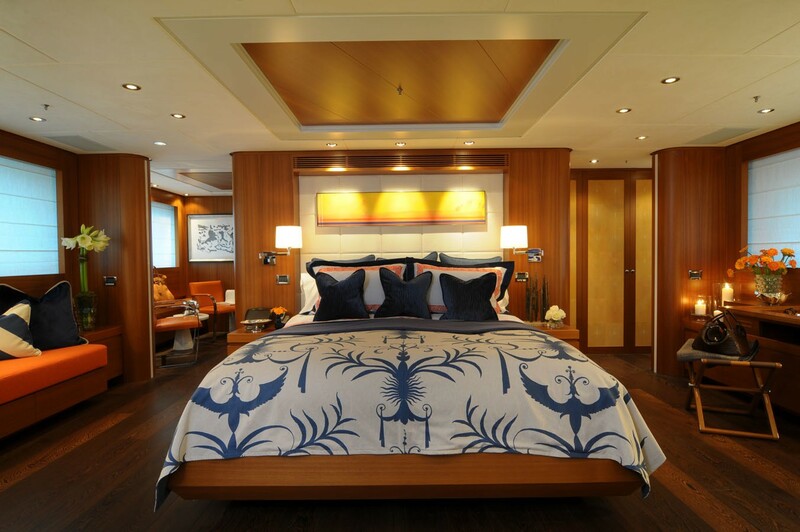 The remaining four double guest cabins are situated on the lower deck. 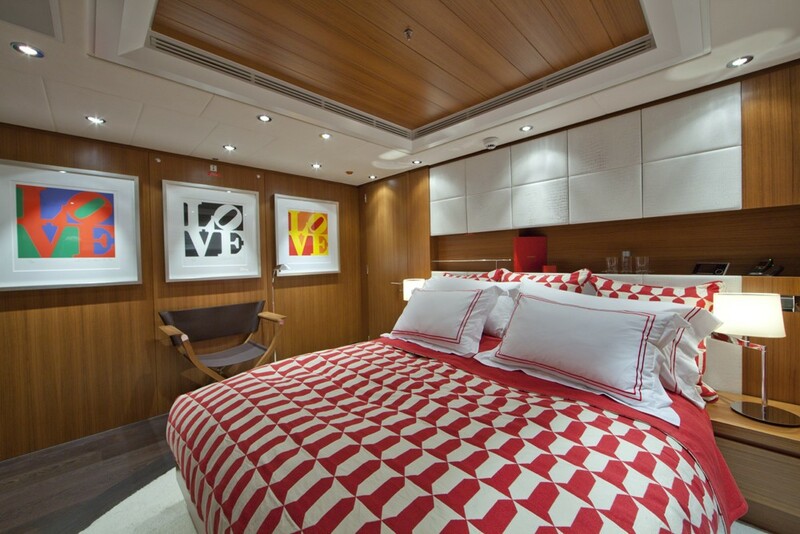 Each cabin have twin beds that can be combined into doubles and have plenty of storage space. 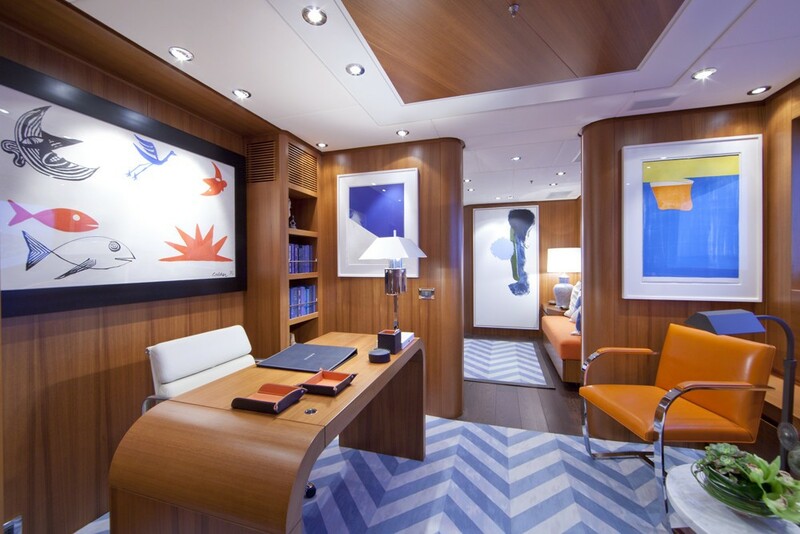 The two aft cabins on the lower deck are separated by a sliding wall allowing them to be merged into a single large VIP stateroom. 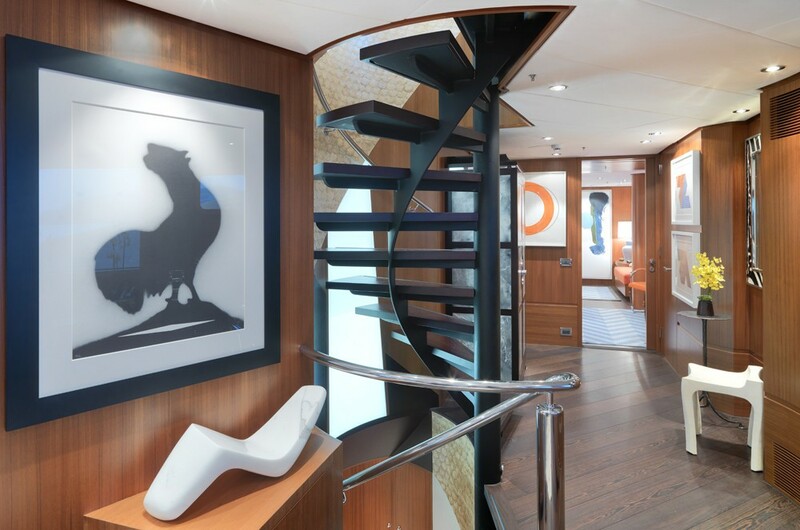 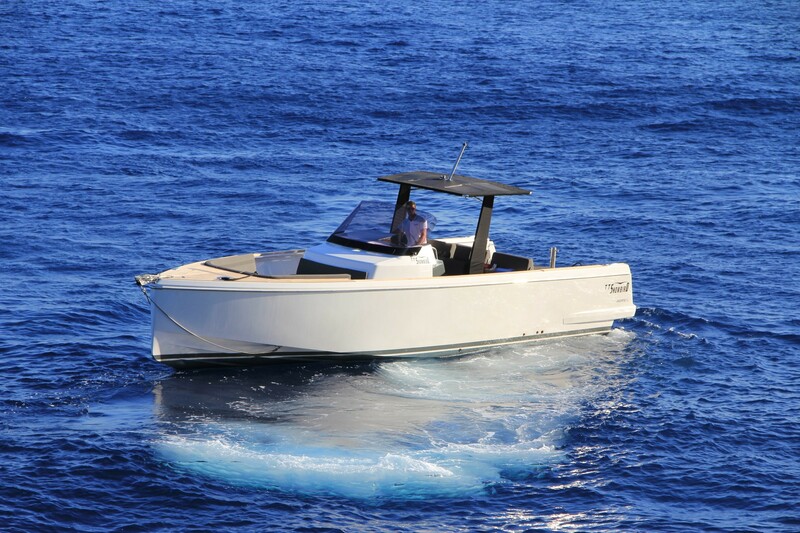 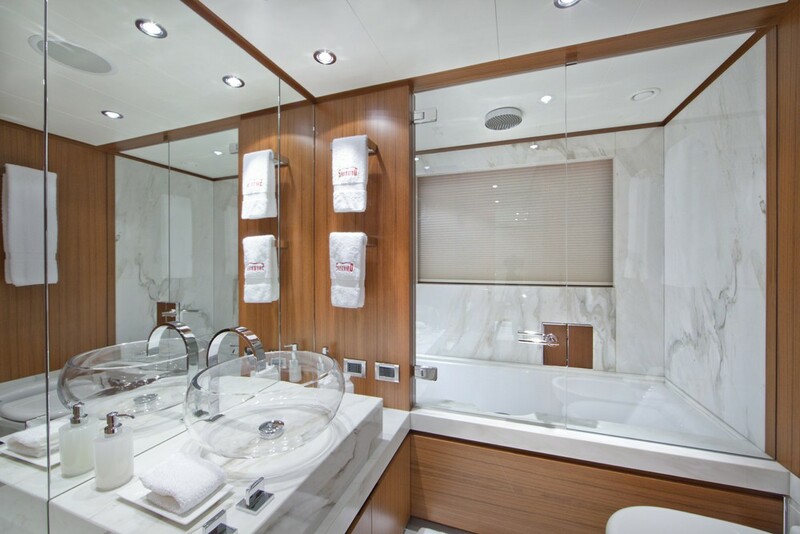 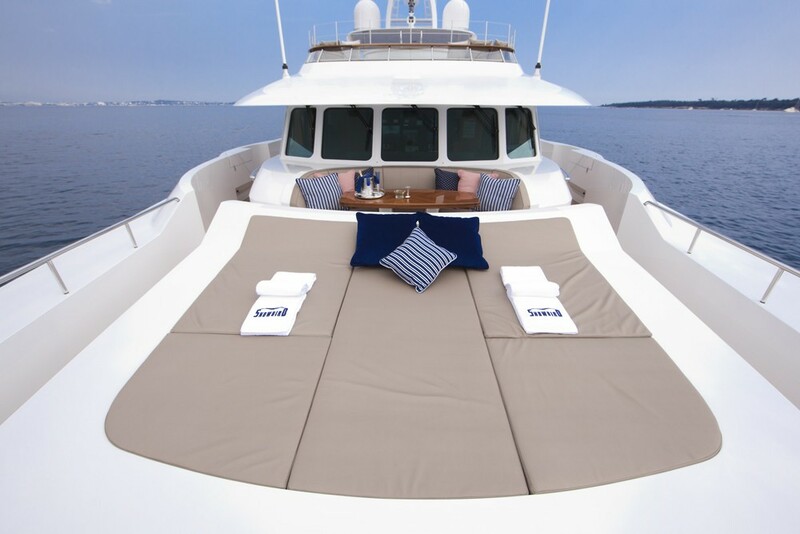 The cabin configuration and layout offers incredible flexibility for charter guests. 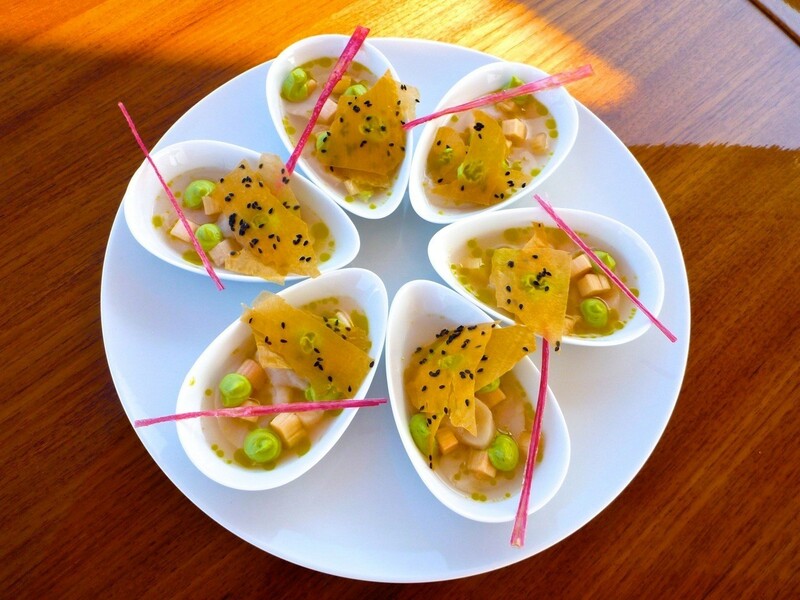 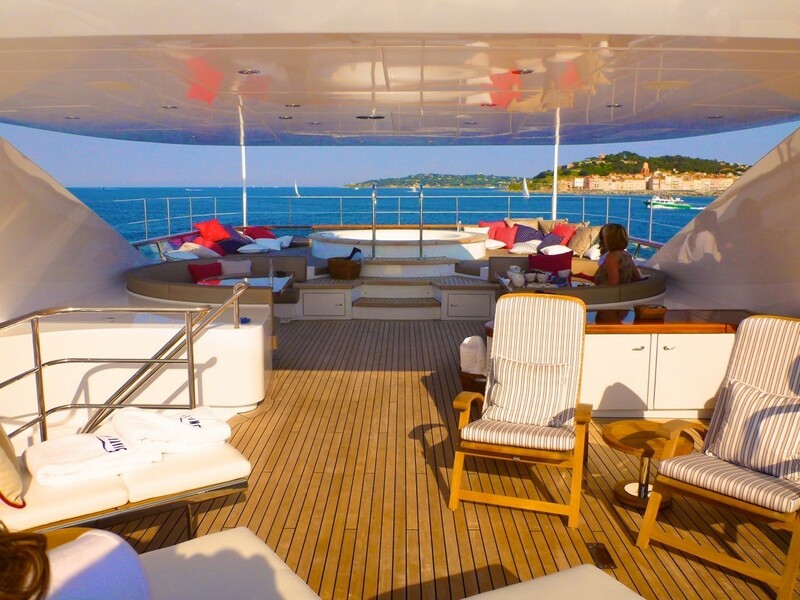 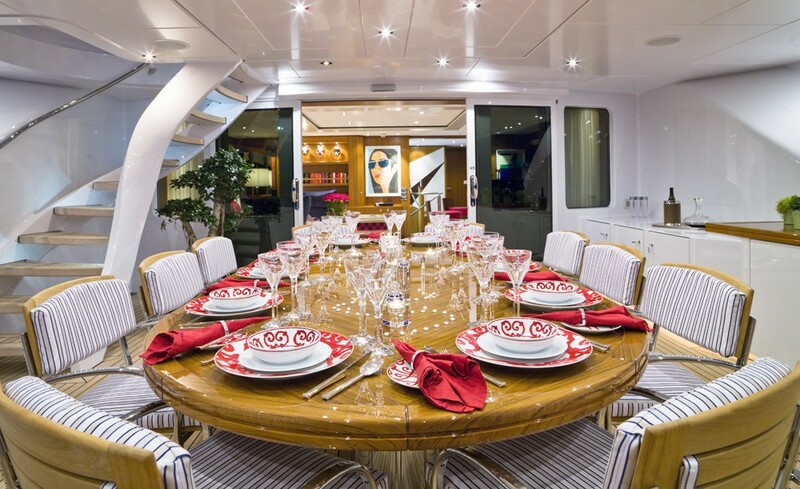 Motor yacht REVELRY has a crew of 7 and is available for charters in the Western Mediterranean. 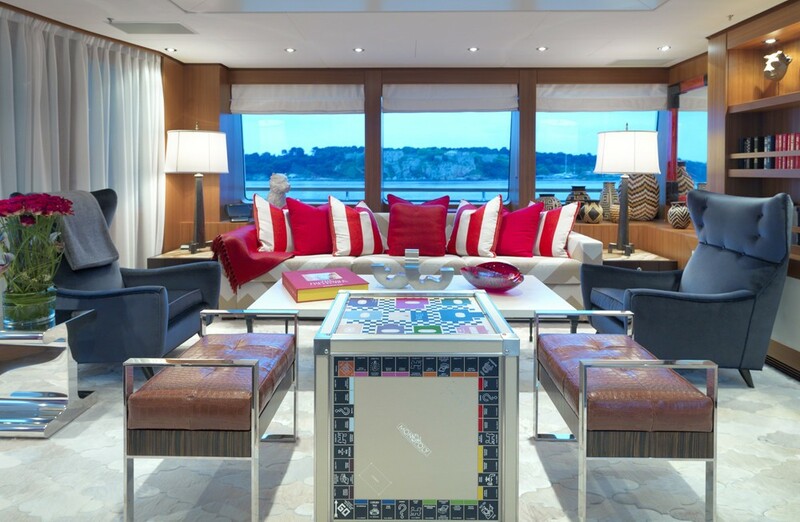 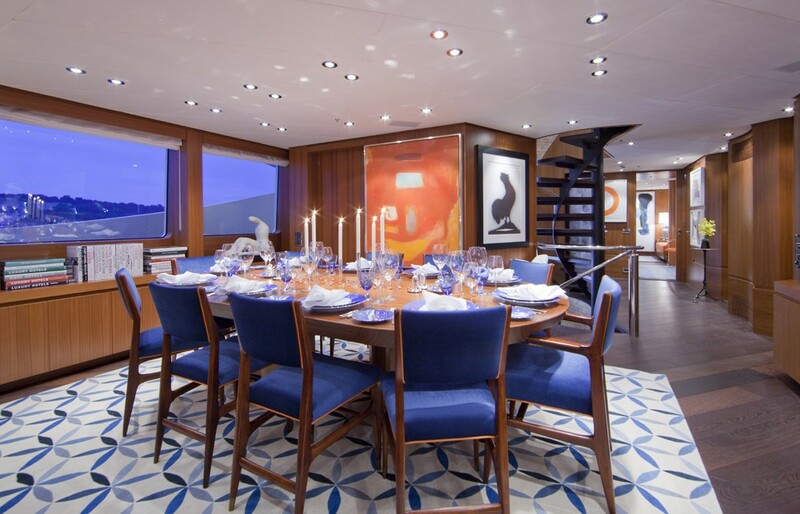 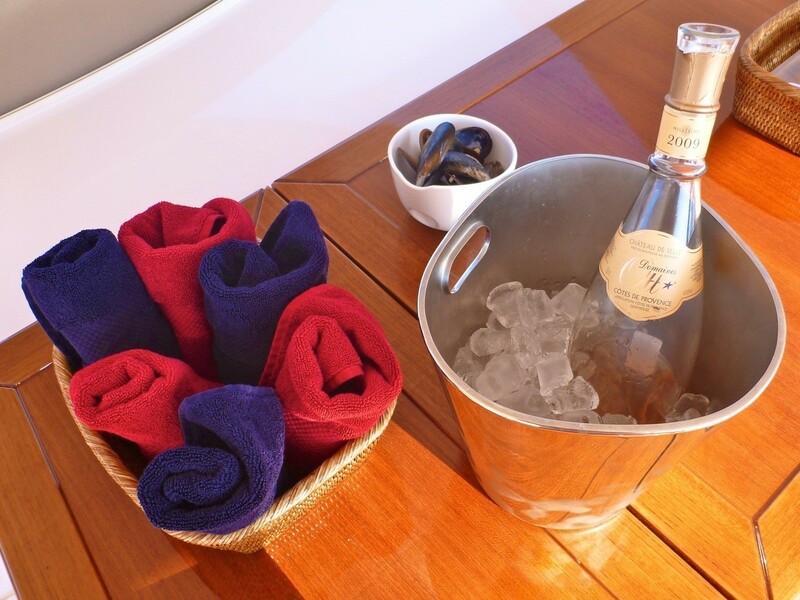 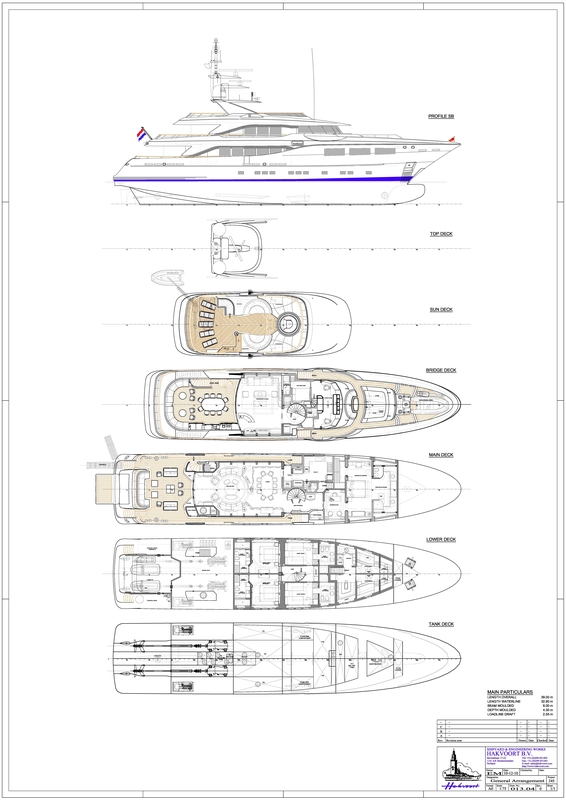 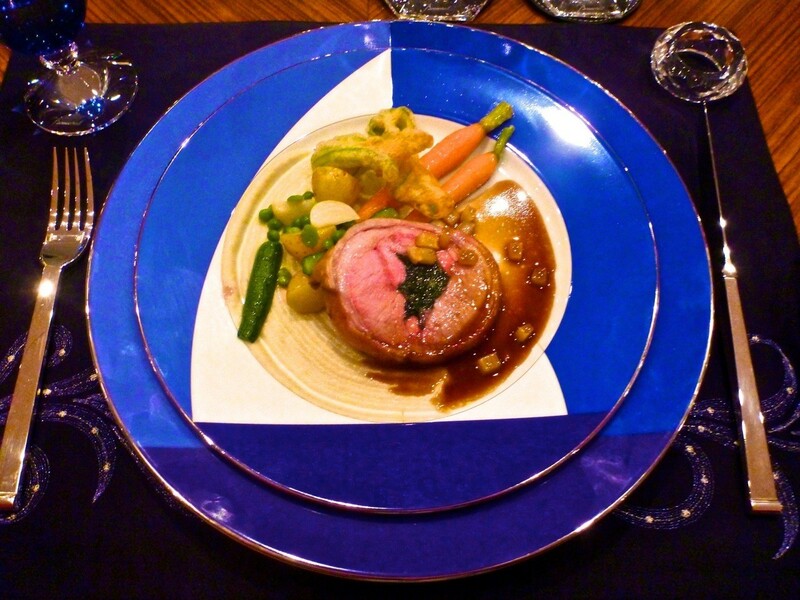 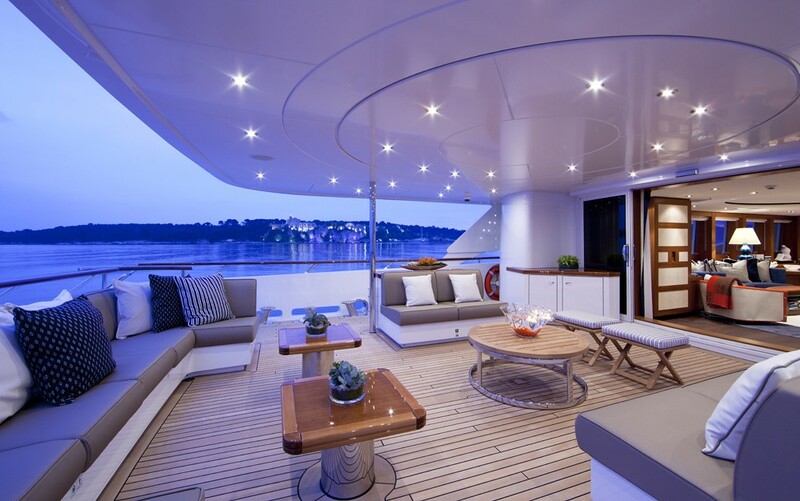 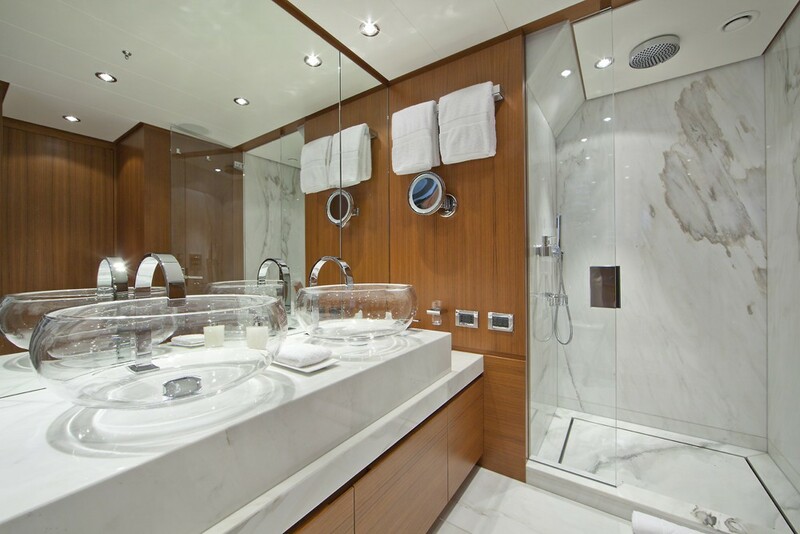 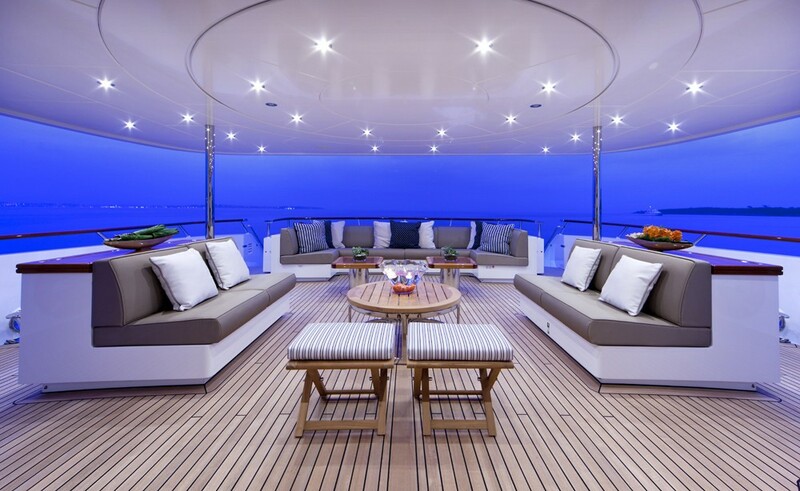 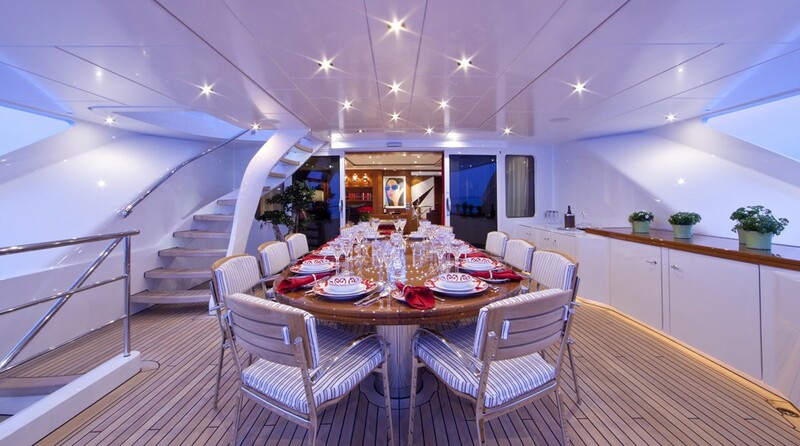 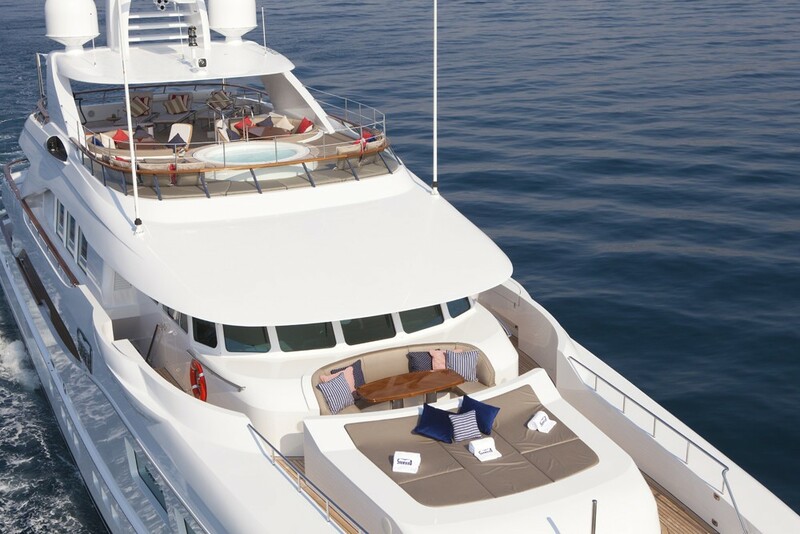 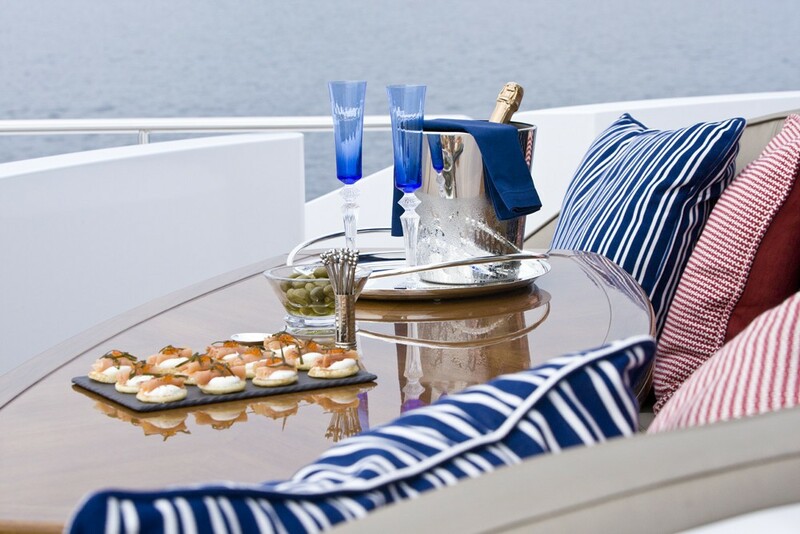 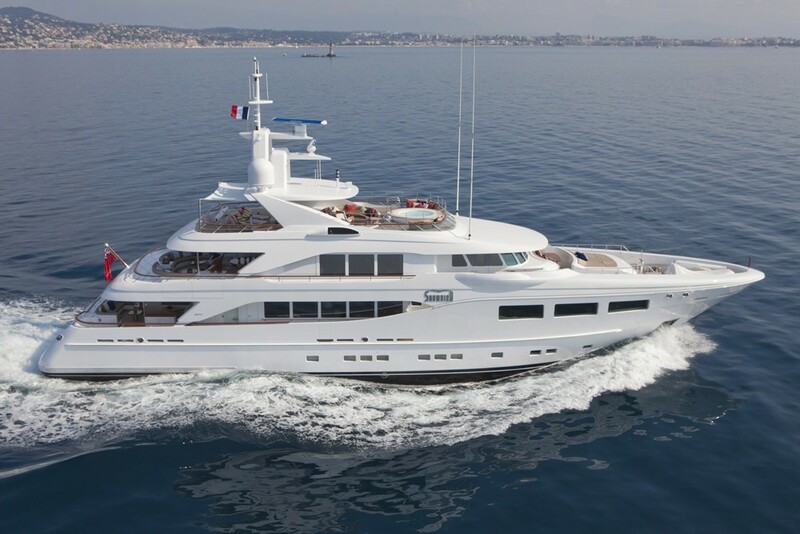 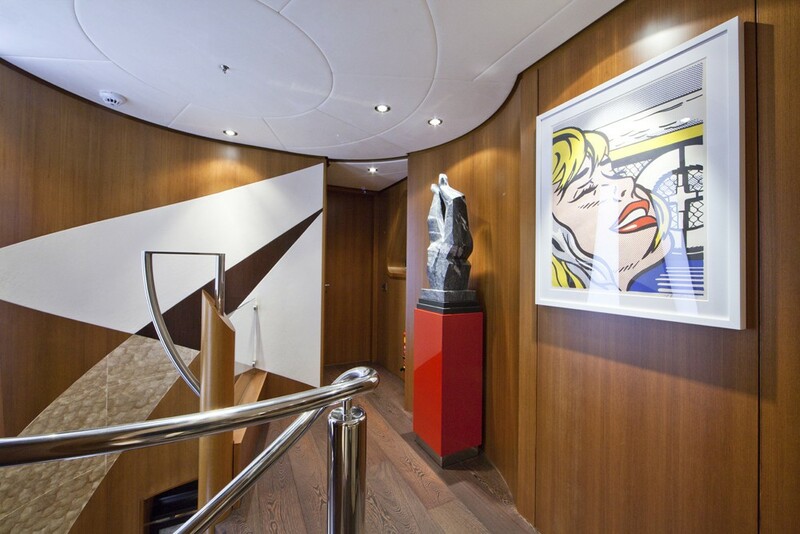 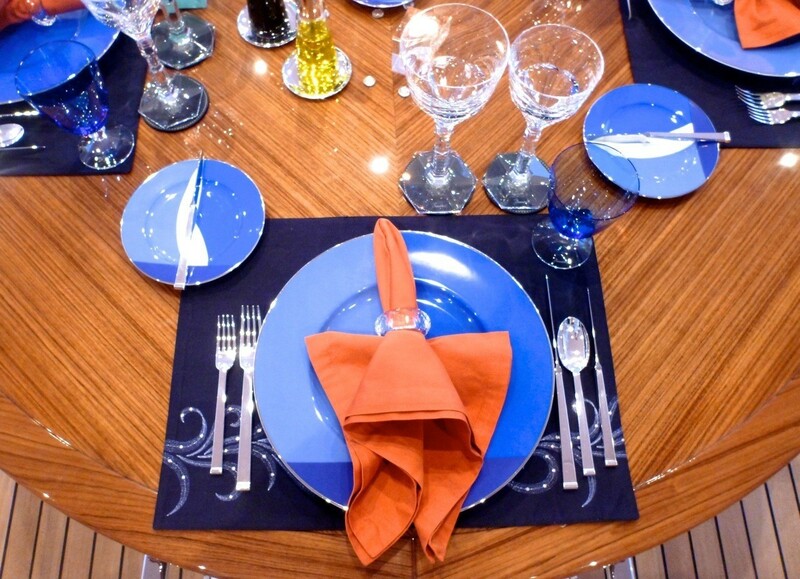 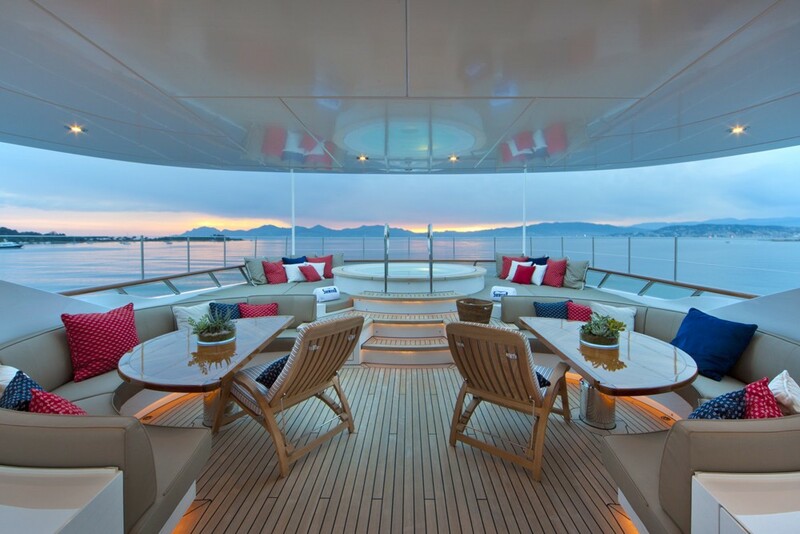 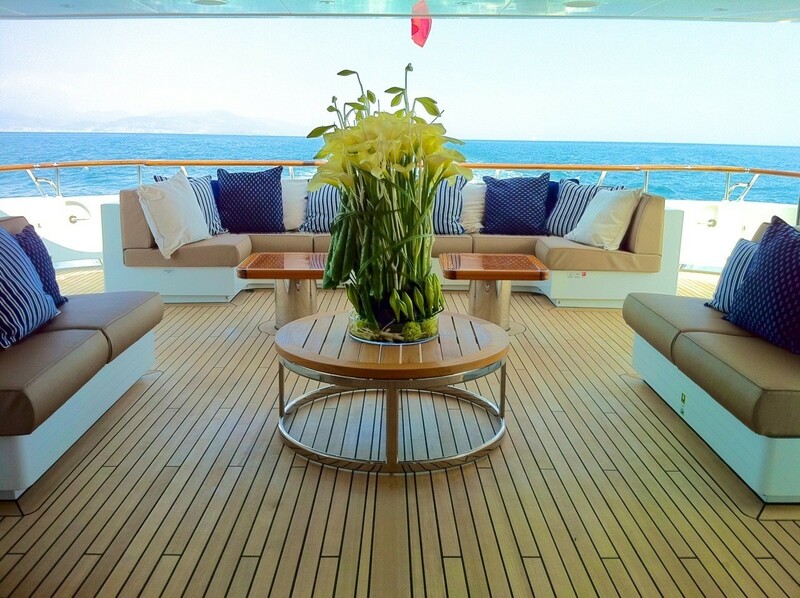 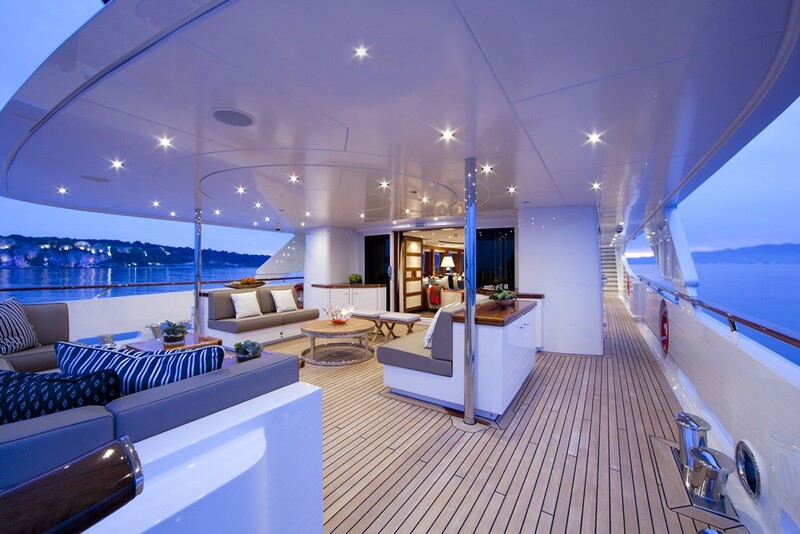 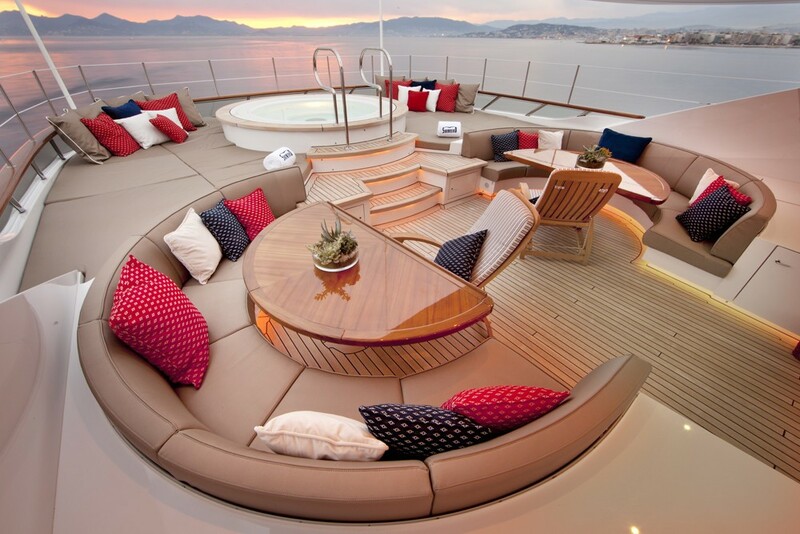 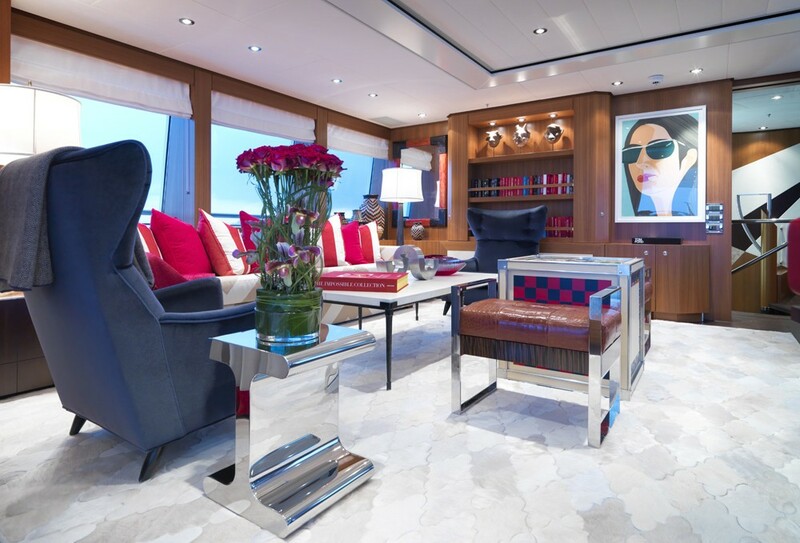 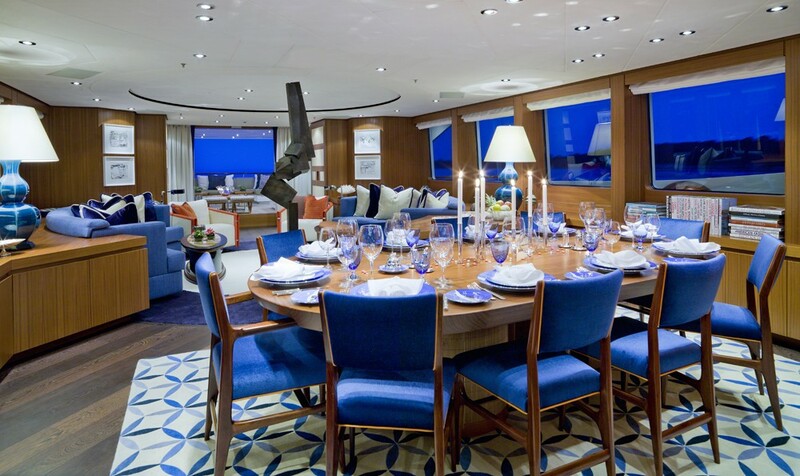 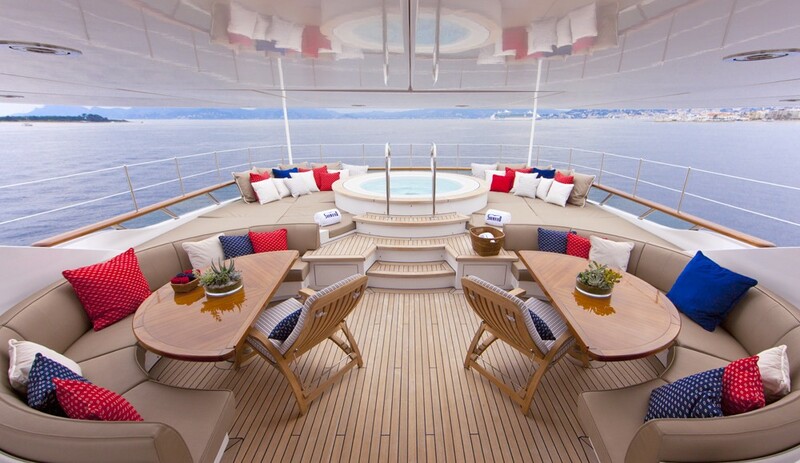 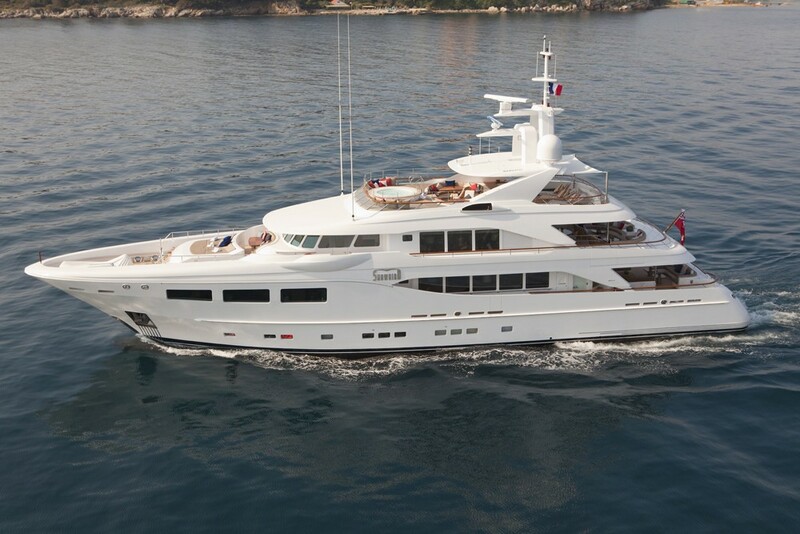 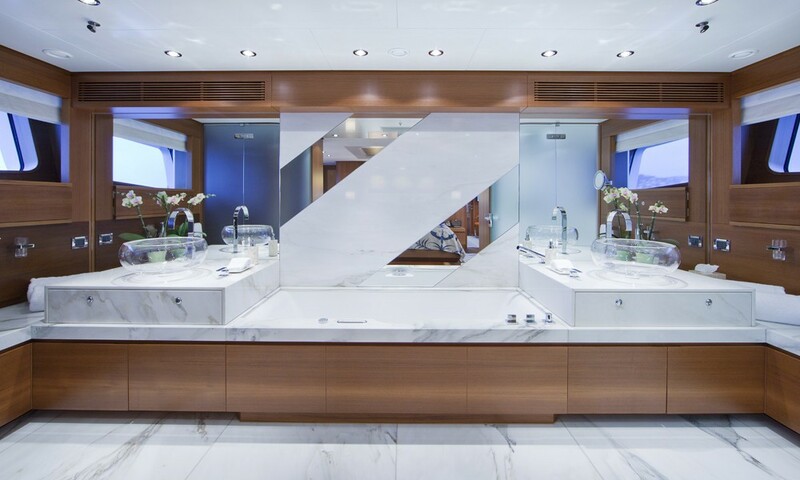 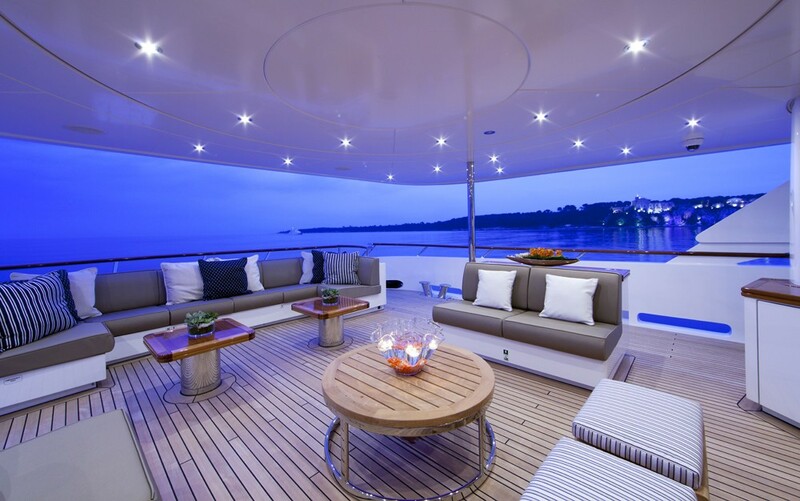 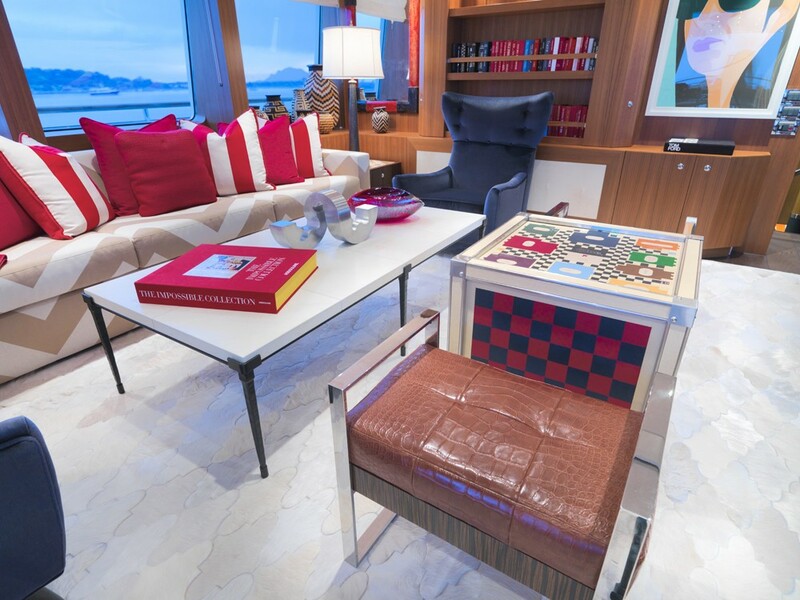 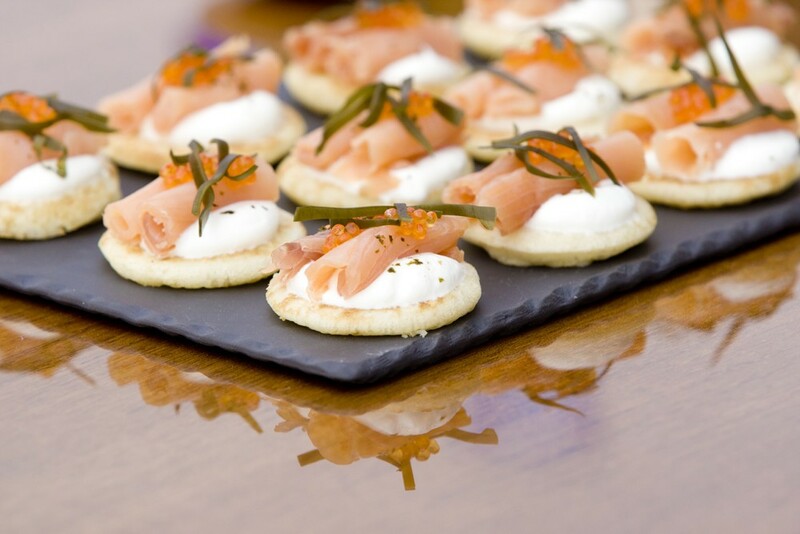 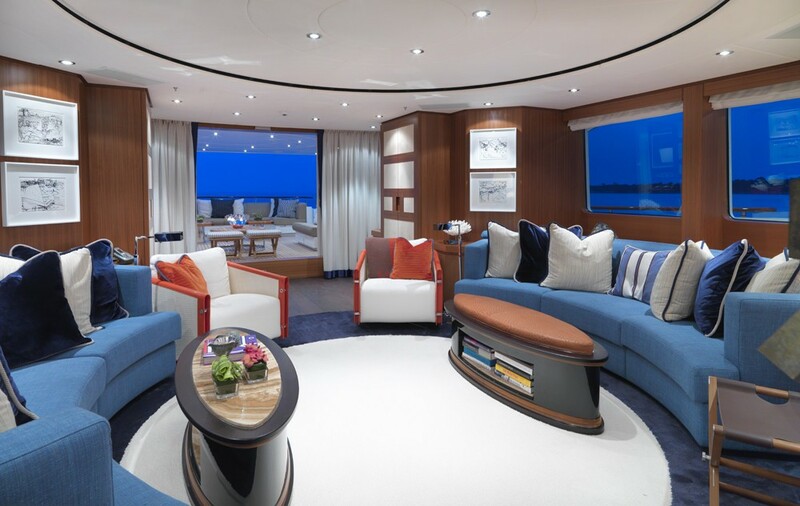 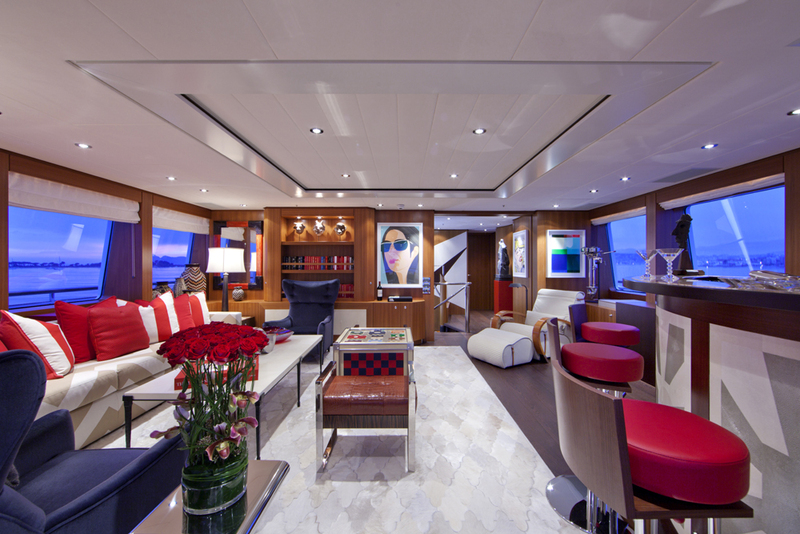 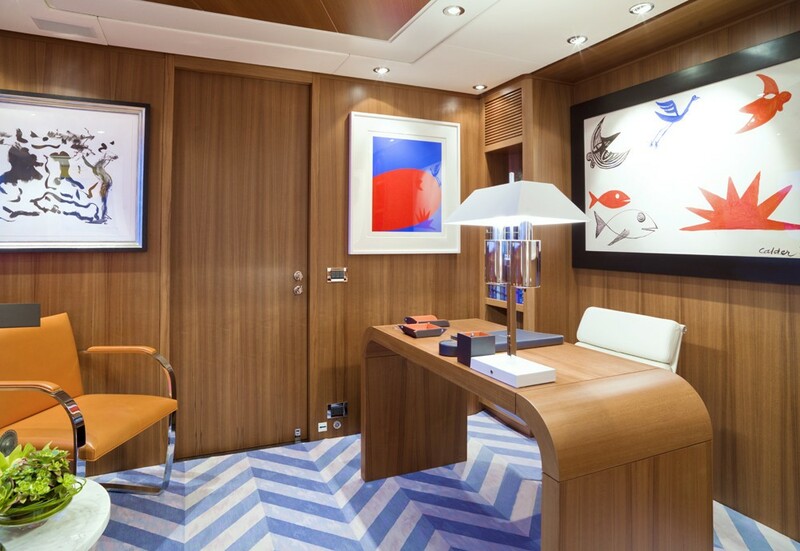 Hakvoort M/Y REVELRY can accommodate 10 guests in 5 cabins. 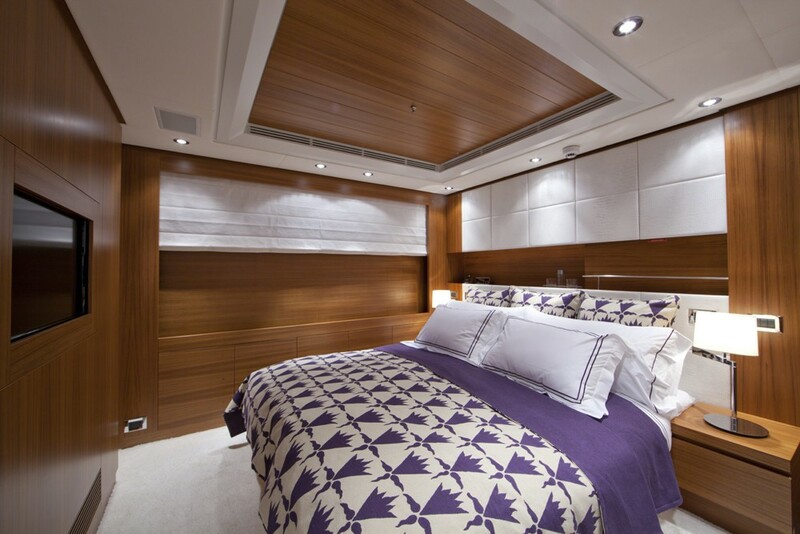 Her Master suite is full width of the beam, is located on the main deck and features a king size bed and large walk in wardrobe plus a study. 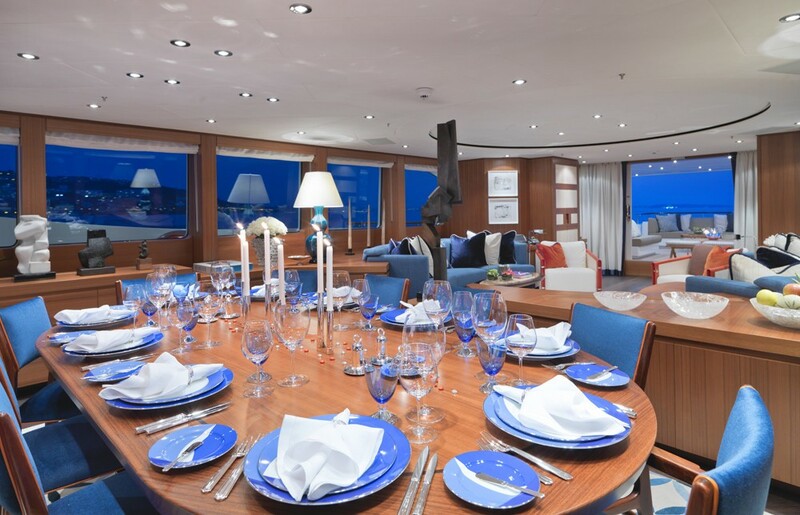 The remaining four double guest cabins are situated on the lower deck. 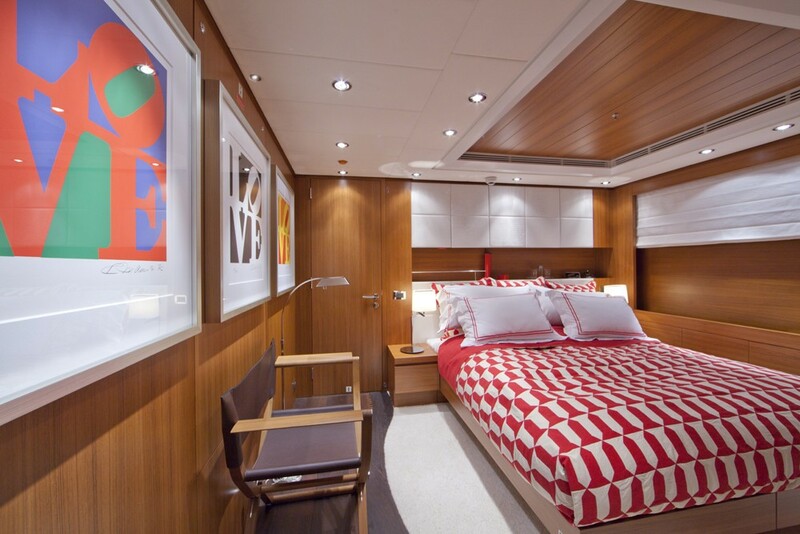 Each cabin have twin beds that can be combined into doubles and have plenty of storage space. 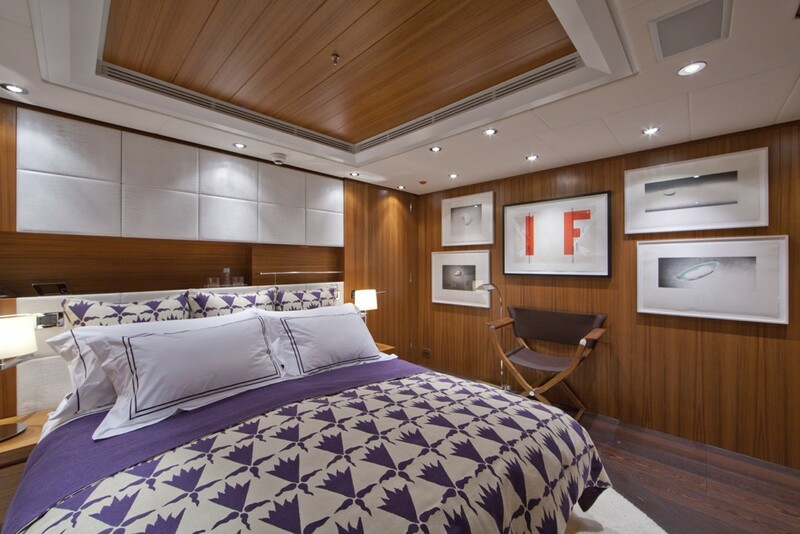 The two aft cabins on the lower deck are separated by a sliding wall allowing them to be merged into a single large VIP stateroom. 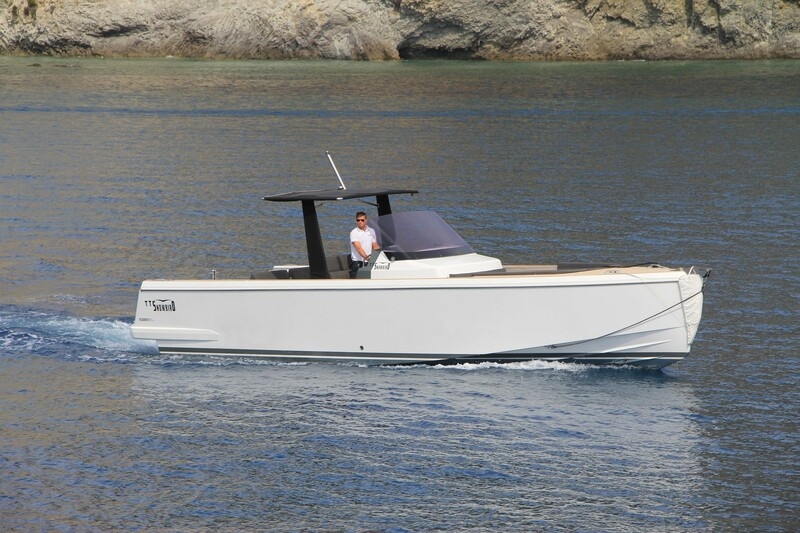 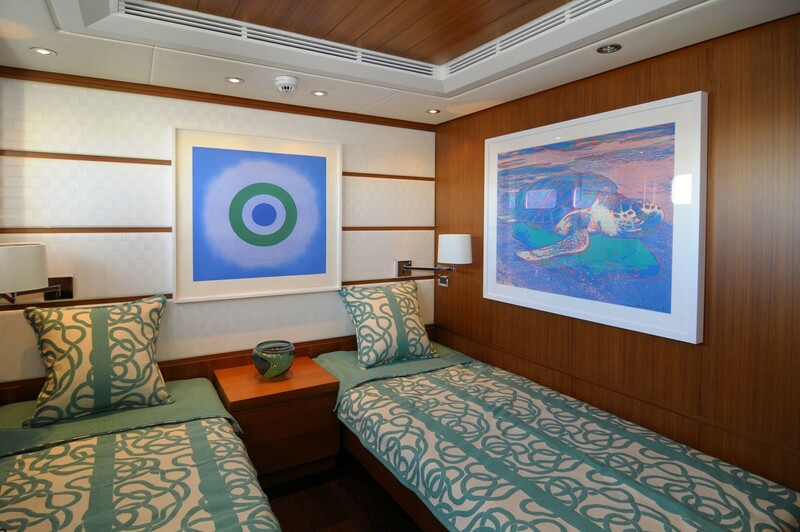 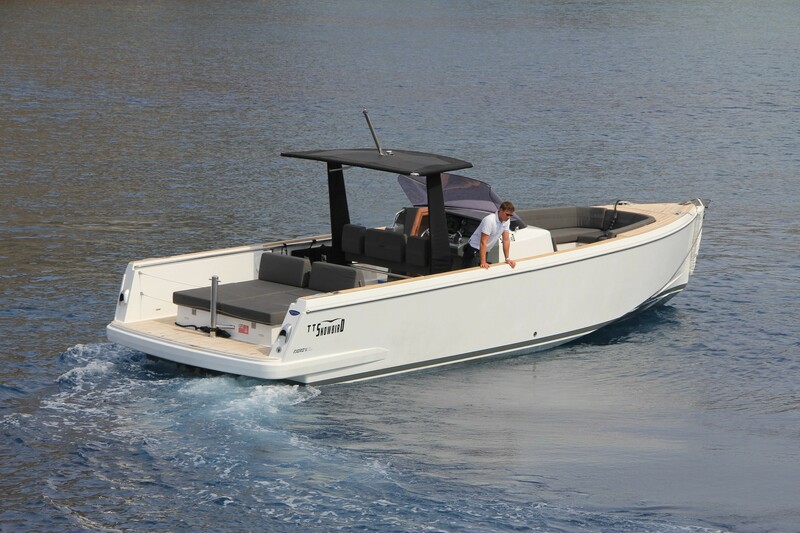 The cabin configuration and layout offers incredible flexibility for charter guests. 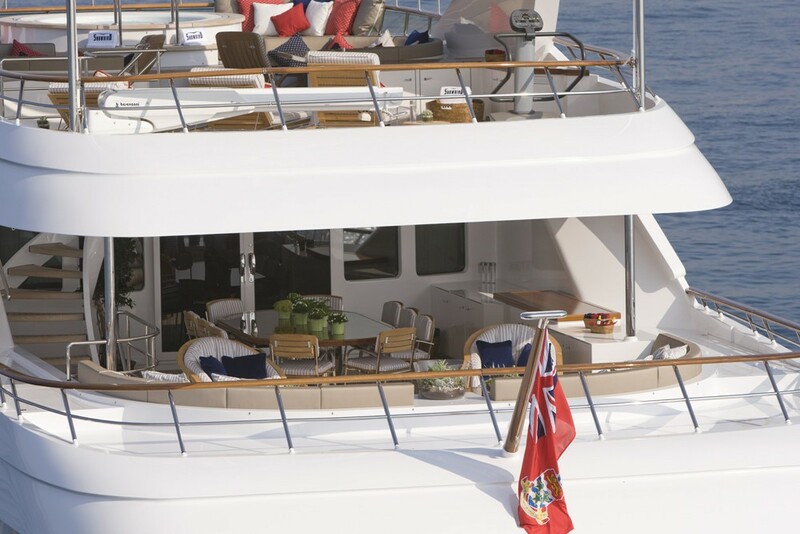 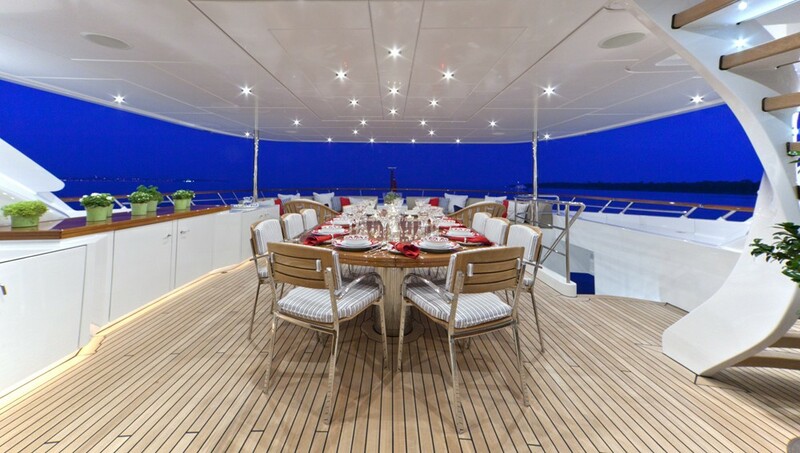 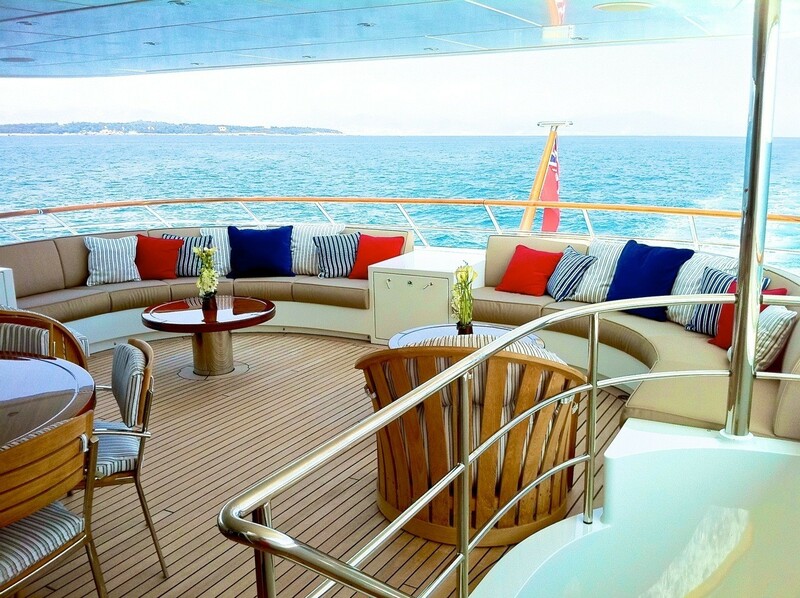 The crew area is located forward on the lower deck allowing crew easy access for service while ensuring privacy for guests.